From Julia Smith's article, An Entirely Different Kind of Union: SORWUC 1972-1986. Reproduced from the SORWUC fonds, UBC. Join us at Pollyanna 圖書館 Library on Tuesday, June 19, for the second of four sessions in the Bread and Roses Study Group, Socialist-feminism and Direct Action in the Lower Mainland. For the second session there will be a conversation with Sandra Currie on her involvement in direct action and as an organizer in SORWUC. 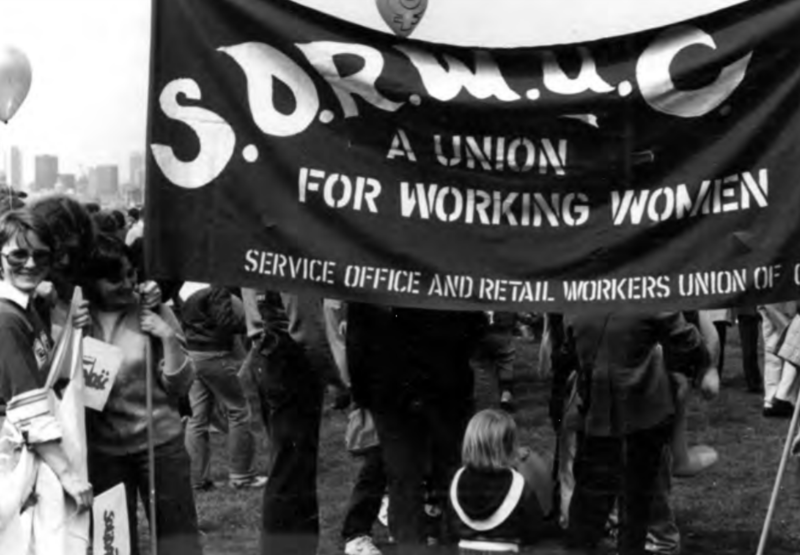 SORWUC (the Service, Office and Retail Workers’ Union of Canada) was an independent, grassroots, socialist-feminist labour union established in Vancouver in 1972. For 14 years, SORWUC organized previously unorganized women workers in the restaurant, office, and retail industry. For access to study materials please email collections@polly-anna.ca. Hosted by 221A Collections Librarian Hannah Dempsey, the Bread and Roses Study Group will read documents of revolutionary women’s organizing with histories of the labour movement in Vancouver and the Lower Mainland. Between June and July 2018, 221A will host two study groups: Bread and Rose and Autonomous Education. For access to the full calendar of events, visit polly-anna.ca/activities.